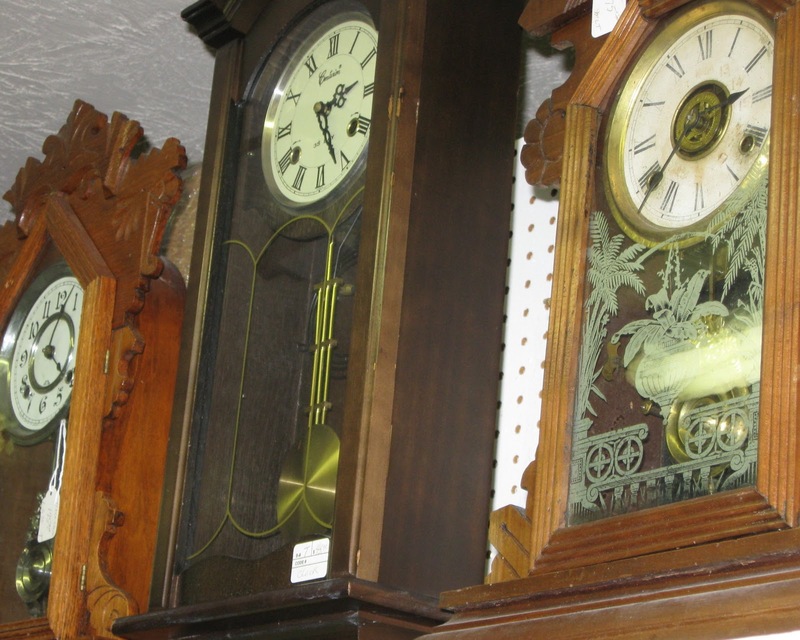 Traditionally, the song Auld Lang Syne is sung by party-goers when the clock strikes 12 midnight on New Years eve. The title words of this song roughly mean, long, long ago. Wrote in the 1700s, it became a traditional folk song in Scotland and eventually spread to many countries including the United States. The song contains a beautiful sentiment of friendship. The YouTube below has a wonderful male vocalist singing Auld Lang Syne. He is not identified on the YouTube site. But nonetheless, he has a crystal clear voice and sings with his heart. The video carries the song's words against a black screen. It only lasts five minutes but it probably will stir some emotions of times long, long ago. vocal artist as Dougie MacLean from his album Tribute. 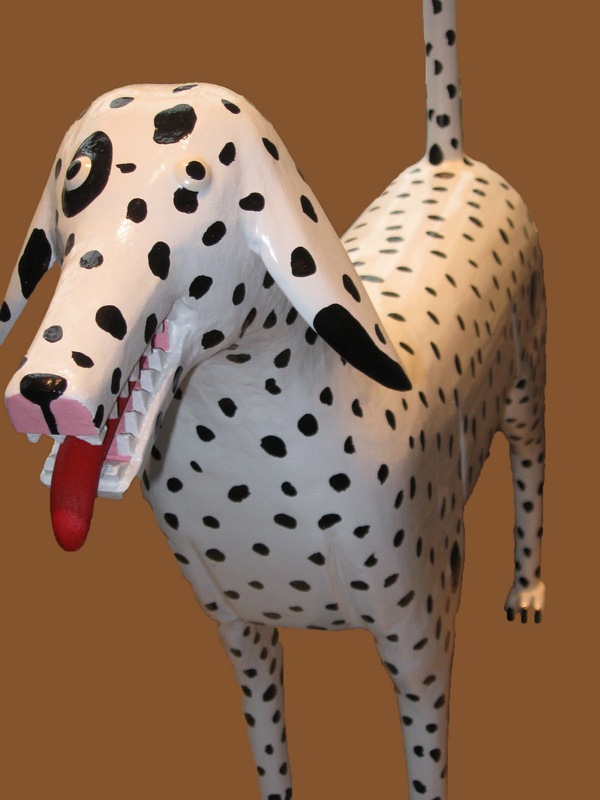 My family has been interested in folk art for several years. Not only for its aesthetic, naive beauty but also for the stories sometimes associated with them. Last summer my youngest daughter and twelve year old granddaughter came for a visit. 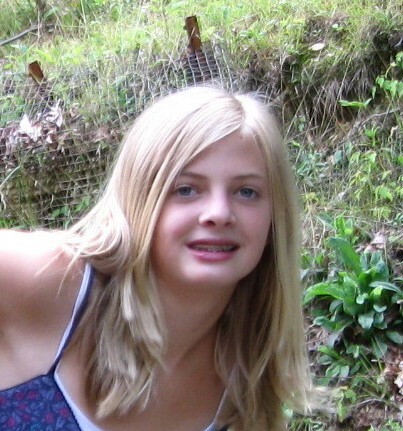 Twelve year old Whitney had a light in her mind that she wanted to, "fire up." while she visited. 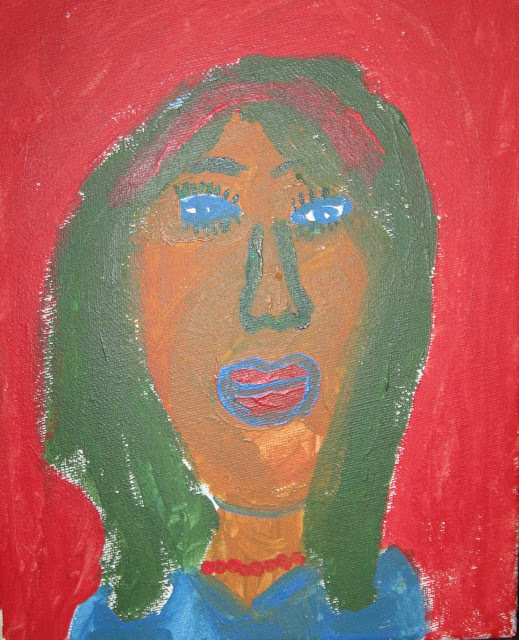 She asked her mother if she could buy some acrylic paints and canvas boards at our local art store. We had no idea what she was up too. 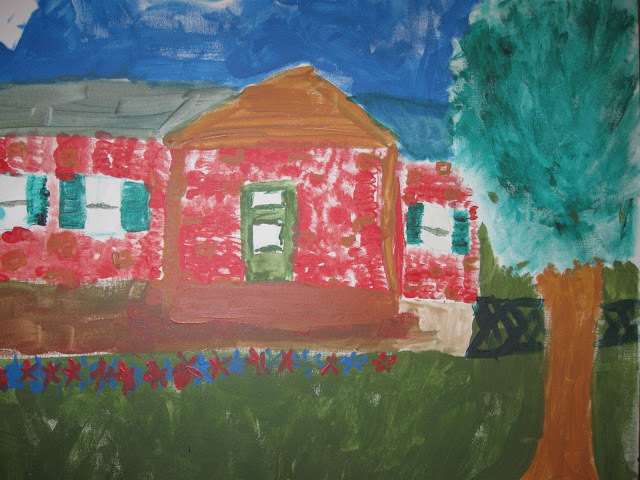 She sat at the kitchen table with her newly bought paints and tried her hand at folk art. She sat for many hours silently working on the paintings. When through she presented two paintings to me for my folk art collection. I love them. I thought she came up with some nice examples of folk art. Believe me, they are now displayed in a very visual part of my home. They now reside among some old Kentucky crocks on one of my vintage benches. The whole montage fits well together. Children sometimes begin their interest in folk art from what they see parents or relatives constructing or collecting. Much folk art is imagined, made, and loved without words . . . it will have gathered into itself something of its creator's freedom (Henry Glassie, 31). It contains variability and tradition. 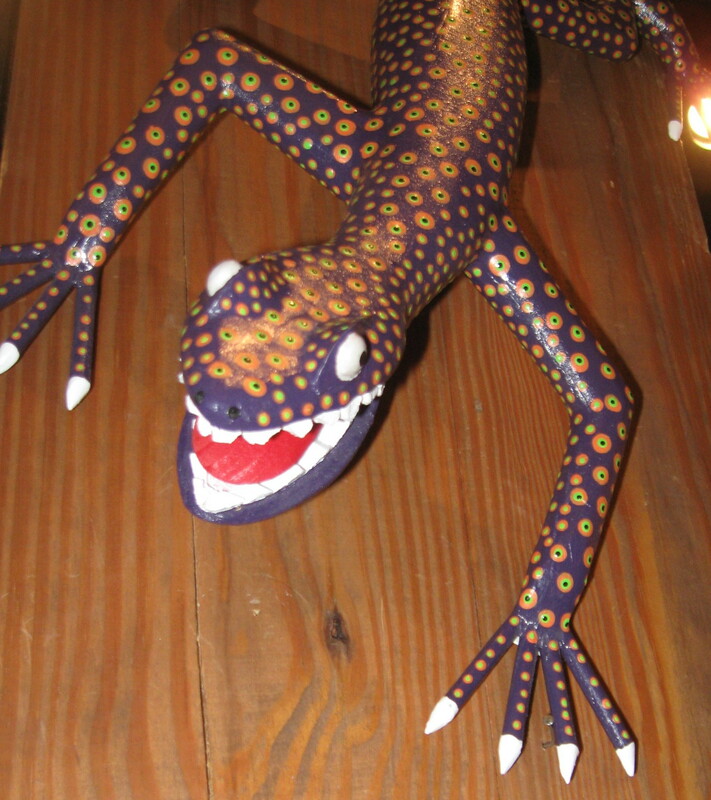 Some folk art constructions include; woman's handwork (quilting, weaving, etc.) 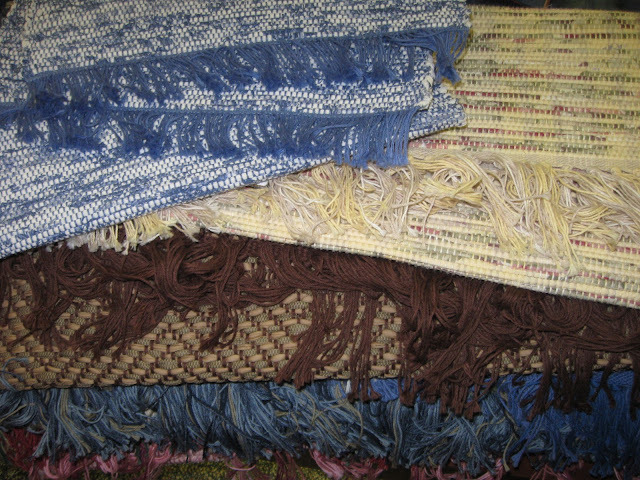 sometimes passed down to daughters -- hand woven basketry often made by parents as well as sons and daughters -- carving skills from father's hands to hands of sons and daughters -- this is but a small sample. Folk art is a widely diverse dimension. Not always passed down through families but sometimes expressed through the spontaneous freedom of the mind. For Whitney I hope that this is a beginning for a future interest in folk art. 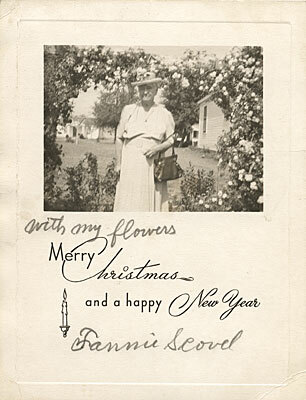 I don't know who Fannie Scovel was but I thought she resembled my great- grandmother when I found this postcard years ago. It's an early photographic card with a printed holiday wish and a comment, "with my flowers." Obviously an important added sentiment by Fannie. 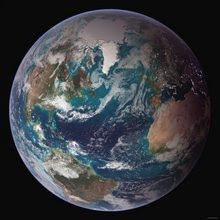 In this new age of computers and blogs I wish all citizens of the world the opportunity to live in peace and love with understanding and kindness. Yesterday I visited the rather new Kentucky Artisan Center that is located a couple minutes off Interstate 75 an artery connecting states between Michigan and Florida. 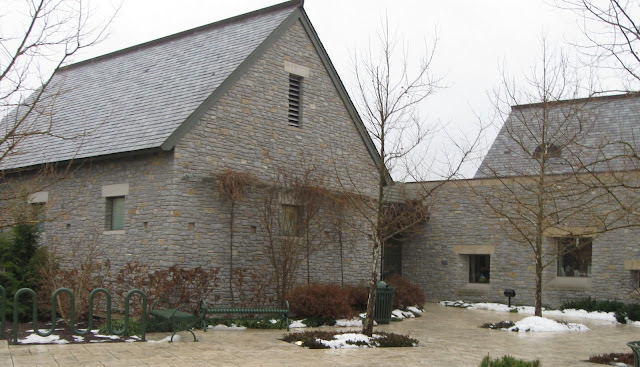 The Center, run by the state of Kentucky, seems to serve highway travelers in several ways. It has a fine restaurant, restrooms, lots of benches and seating both indoors and outside and a marketplace for Kentucky made goods. One can find artwork, crafts, books, and gourmet food all with ties to the state and for sale. Art work and crafts dominate the marketplace. Many beautiful and unusual pieces can be found -- all contemporary and for sale. 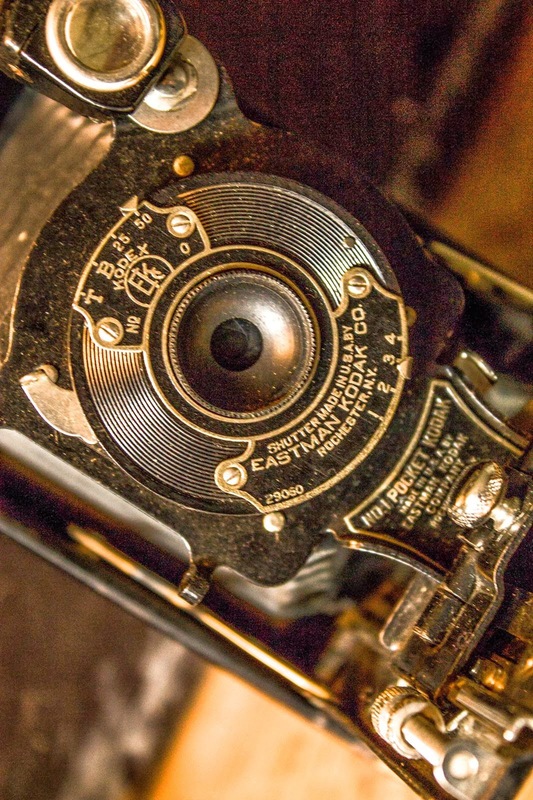 The items cover a broad spectrum, some reflecting the early forms of Kentuckian folk design, while some others, the newly evolved Kentucky arts and crafts, are dynamic and fit well with the old folk forms. I took a few photos of pieces that I thought were good examples of the contemporary art work. Books by many Kentucky authors such as Barbara Kingsolver or Wendell Berry line the shelves on one wall. I perused them and found a few that I was unfamiliar with. I wrote them down and will order them through my local library. Overall it was a nice break to visit the Center and stroll through the for sale items made in Kentucky. It was a refreshing exposure to locally made and the idea of local economies. 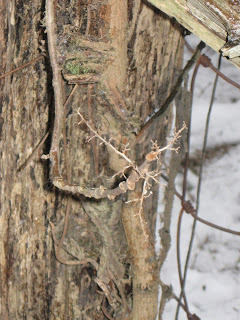 WINTER ID -- POISON IVY OR VIRGINIA CREEPER? Winter changes the looks of plants. At least I think so. 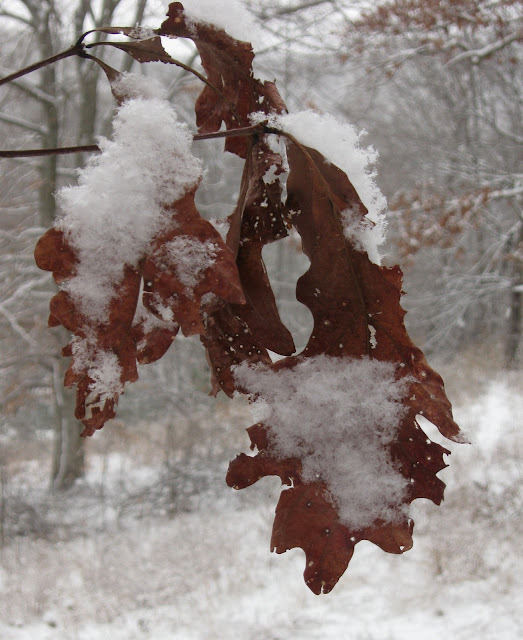 If you are one that likes to walk trails in the woods and fields in the winter you might want to be aware of poison ivy -- it can cause allergic reactions year round. It grows throughout the United States. If you brush against the vine with your clothes the rash-causing oil will be picked up and will require washing to get rid of it. 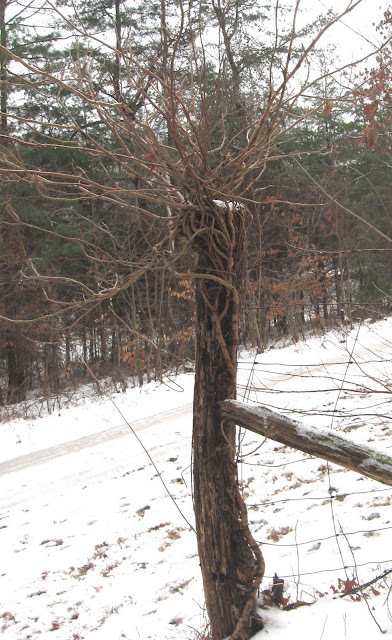 Also, you should be aware not to cut any of its lovely curving twigs for winter bouquets from its woody vine. 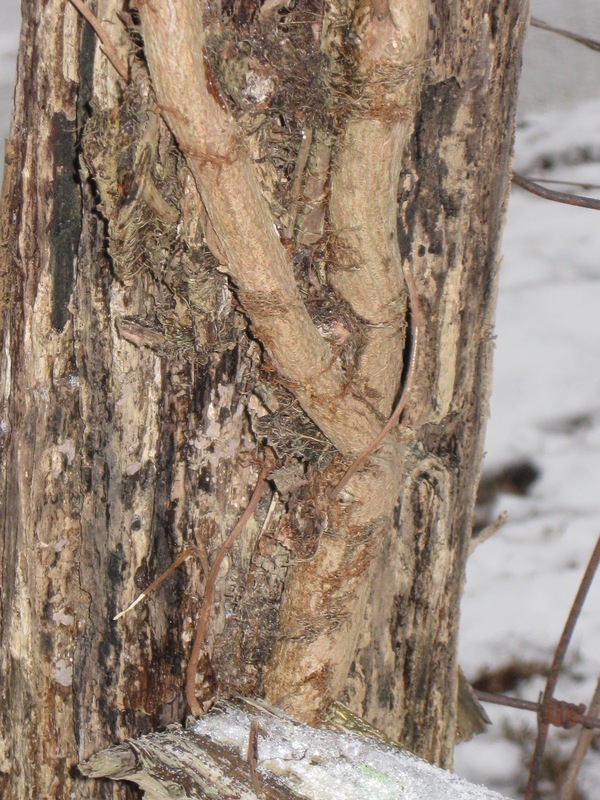 But how is one to know if the plant is poison ivy when observed in the winter for there is another that looks similar -- Virginia creeper. 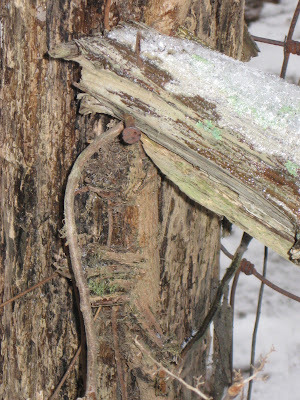 THIS 8 FOOT VINE HUGS AN OLD FENCE POST. IS IT POISON IVY OR VIRGINIA CREEPER? Poison Ivy contains a chemical oil that causes a rash and irritation that can be quite unpleasant. Not all people are sensitive to the ivy’s oil but may develop an allergic reaction at any age. Birds love the white berries that grow in small clusters along the vine in late summer. They provide nourishment for flickers, sapsuckers, pheasants, and quail to name a few. 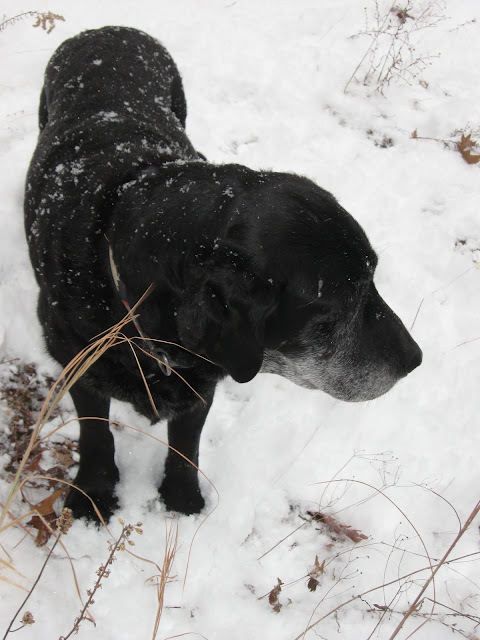 But no white berries are to be found in the winter. Nor its leaves of three, let it be clusters. To humans the whole plant is toxic. Another climbing woody vine that grows similar to poison ivy is Virginia creeper. 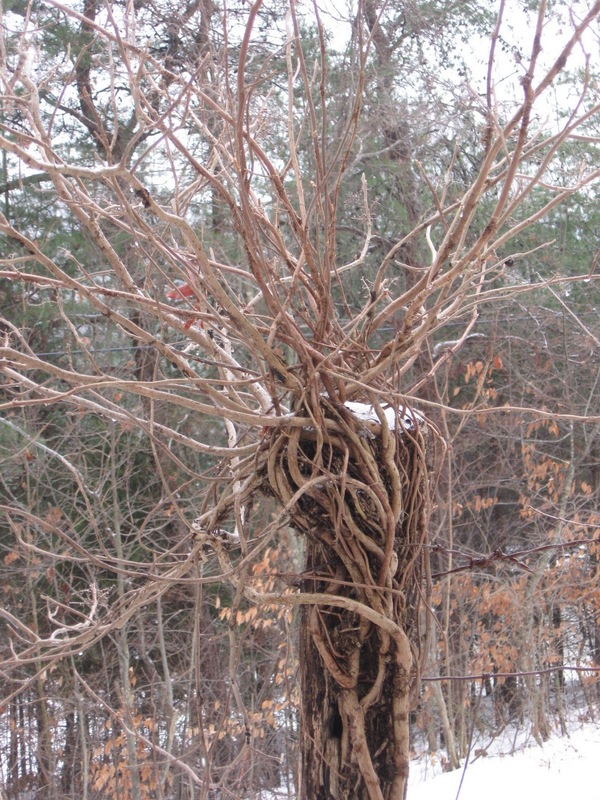 Both plants have aerial roots protruding all along their woody stems and they both have woody shrub- like vines. Virginia creeper also provides fruit, small blue berries, to a host of animals such as eastern bluebirds, cardinals, Leopard moths, deer, skunk and many more birds and mammals. The berries are found in late autumn. The berries are very toxic to humans. Both Virginia creeper and poison ivy grow in close proximity to each other and sometimes twine up the same post or tree. So given the similarities between the two, how does one ID poison ivy from Virginia creeper in the winter? 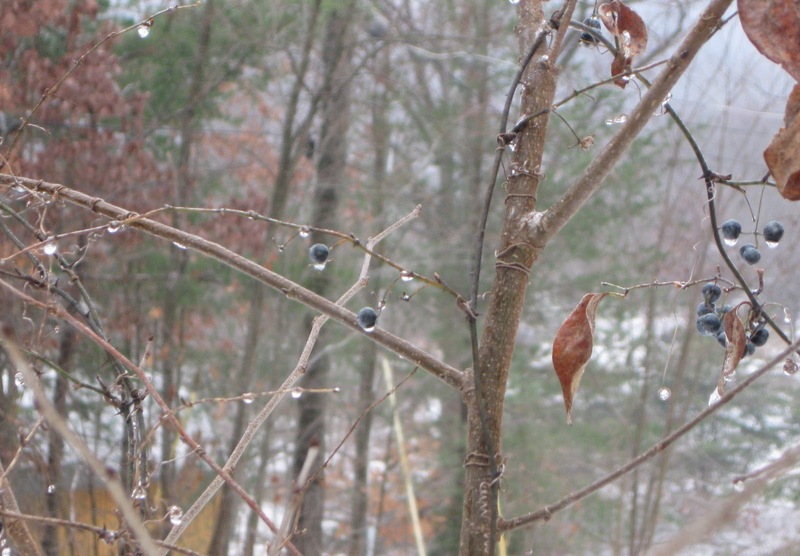 With their leaves gone and the berries off the poison ivy – what are the identifying traits that distinguish them from each other? TWIGGY SMALL SHRUB CLOSE TO LARGE UNIDENTIFIED PLANT -- BELIEVE BERRIES OF VIRGINIA CREEPER? Near the large unidentified plant was a smaller upright twiggy plant with a few blue berries still on it. Could this be Virginia creeper? Was the large plant I was trying to identify also Virginia creeper? I know that there are lots of naturalists or plant people out there that probably could help me out in identifying this large twisting vine. Perhaps even provide tips for others needing to identify poison ivy along winter trails. Does anyone have any clues? Please comment with any information or suggestions – I surly would appreciate it. 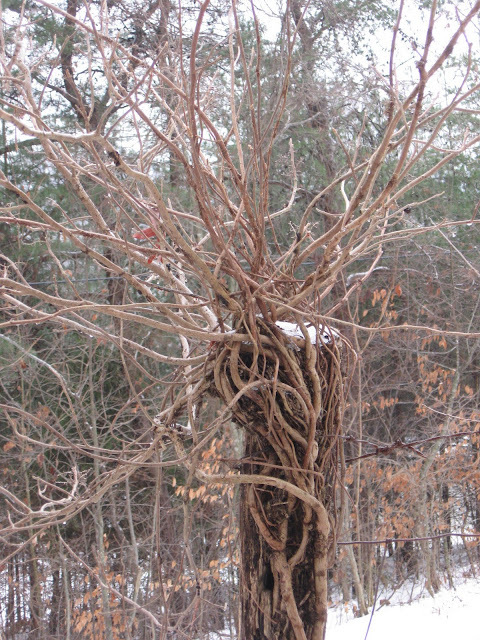 In the meantime I will steer clear of this beautiful twisting vine until summer when its leaves sprout. Then I can count its leaves. Leaves of three, let it be, is an old saying about poison ivy -- meaning count the leaves in its cluster -- if five its Virginia creeper -- if three, stay clear! 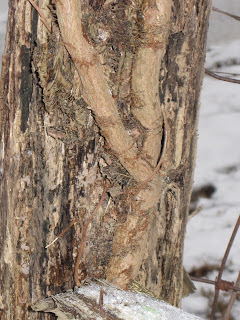 I am adding a link about winter poison ivy HERE. It is from OUTSIDE MY WINDOW -- A Bird Blog with Kate St John. She discusses the ivy is ways that I thought were a great supplement to this post. 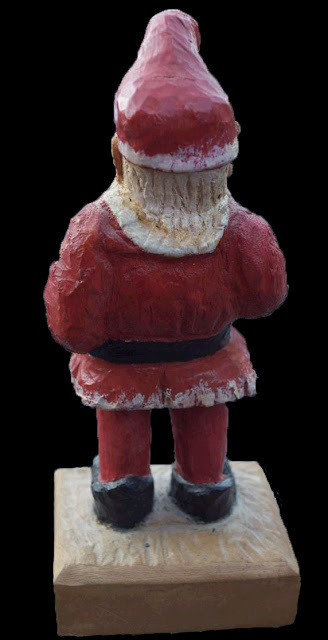 Although I swear that this is the jolly guy, Santa Claus, -- the carver, Frederick Hyatt named his carving Santa Helper. 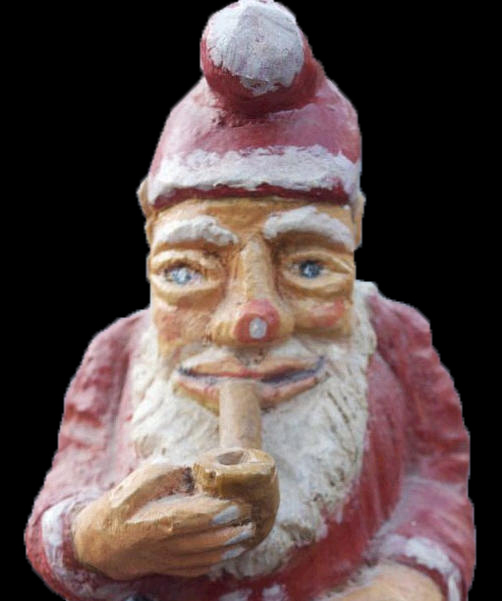 Perhaps, by the fact that this figure was smoking a pipe -- it made him ineligible for being Santa Claus. 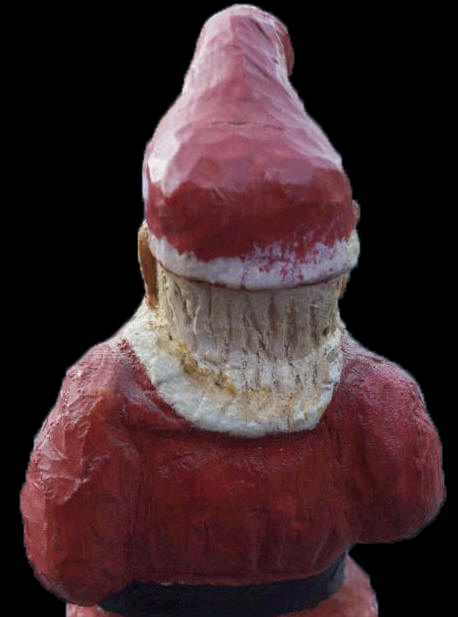 This whimsical carving is a robust-full figured carving approximately 8 inches tall. It was not only carved by Frederick Hyatt, it was painted by him in its red, white, and black Santa colors. It is all one piece from the bottom platform to the tip-top of his hat. The wood being basswood. 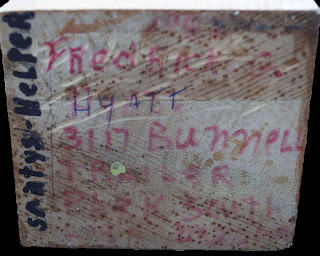 Mr. Hyatt was a folk carver and artist that went fairly unnoticed during his life time. 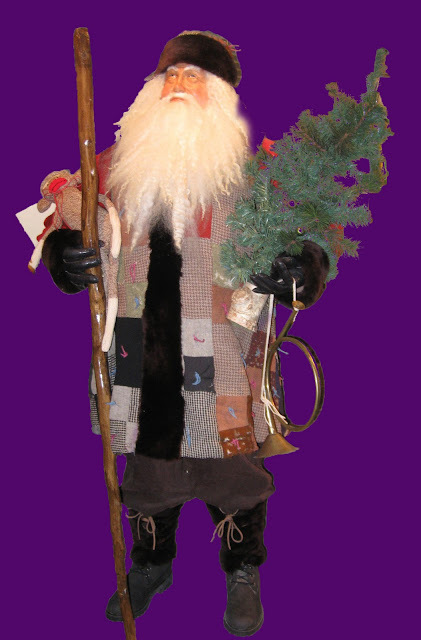 He lived meagerly in his old age and was bound by a wheelchair. He lived in an old trailer in what he referred to as a trailer park consisting of about twenty trailers. This park was located in an urban setting. I knew him for a short time and then lost track of him. Below is the bottom of the platform where he signed his signature and address in Lansing, Michigan. His title of the piece runs up the side. I thought this little Santa expressed Hyatt's joy for Christmas. It exemplifies the idea that life is what you, alone, make of it. May your holiday be a pleasant one. One Christmas eve, when I was a child, as I laid in bed listening for the sounds of Santa on the roof I overheard the the voices of my parents discussing a gift that I was to receive from Santa. 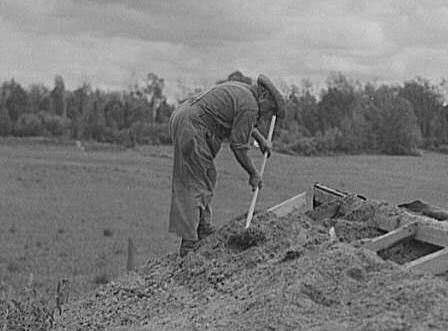 It was a time when folks were still feeling the repercussions of the depression and WWII. Money was beginning to flow again in the economy yet people were still in the non-spending mode. The gift they were discussing was a hand-me-down cradle that was last used by my older sister. My father had just refinished it and put a chime on the rocker so that it played a tune when you rocked it. It was a lovely doll cradle by the time he had it all redone. I loved it when I saw it under the tree the next morning -- even though I knew it was a hand-me-down and not from Santa. I played along with the idea of Santa bringing it. I had the cradle for many years. -- somewhere along my path of life I lost it. That cradle had taught me many things about family and living according to ones values. It taught me that my father, with love and kindness for his daughter, took the time to redo the cradle and add music to it. Also, it taught me the meaning of the phrase -- waste not, want not. My parents had to make do with what they had -- they didn't extend their tight budget to more than they had in their pocket. 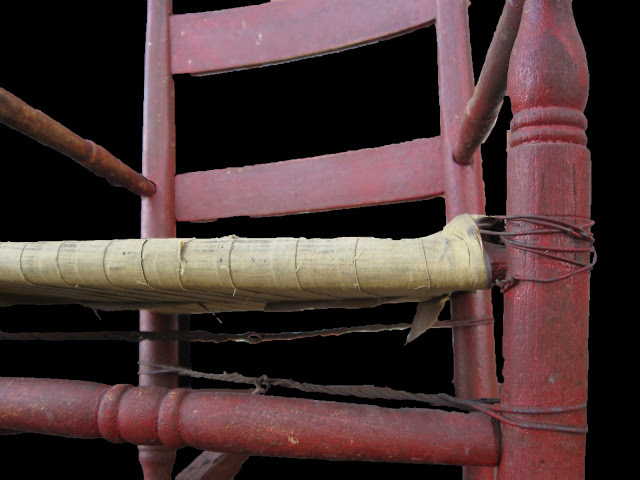 One day, later in life, I bought a child's worn old red rocking chair. 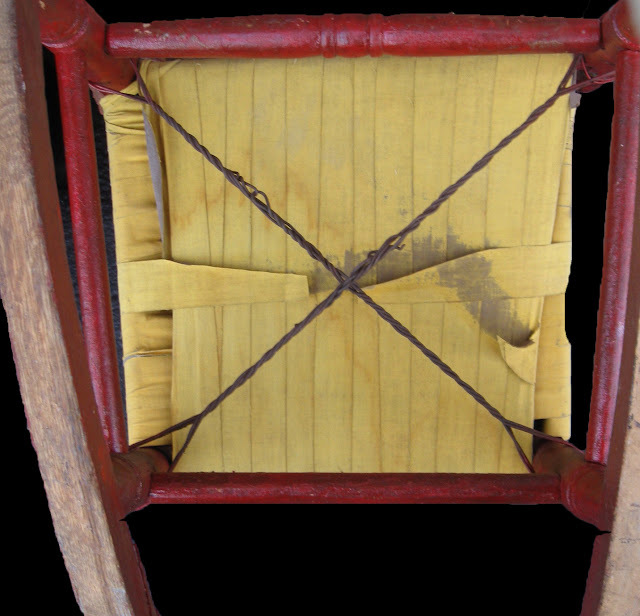 It reminded me of the lessons I had learned from my cradle -- the chair obviously had been used by several generations. 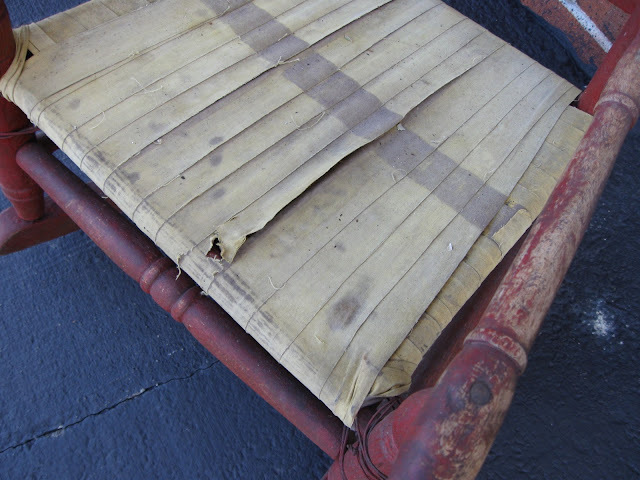 There was evidence that the rocker had several problems at one time and that someone had lovingly fixed them. 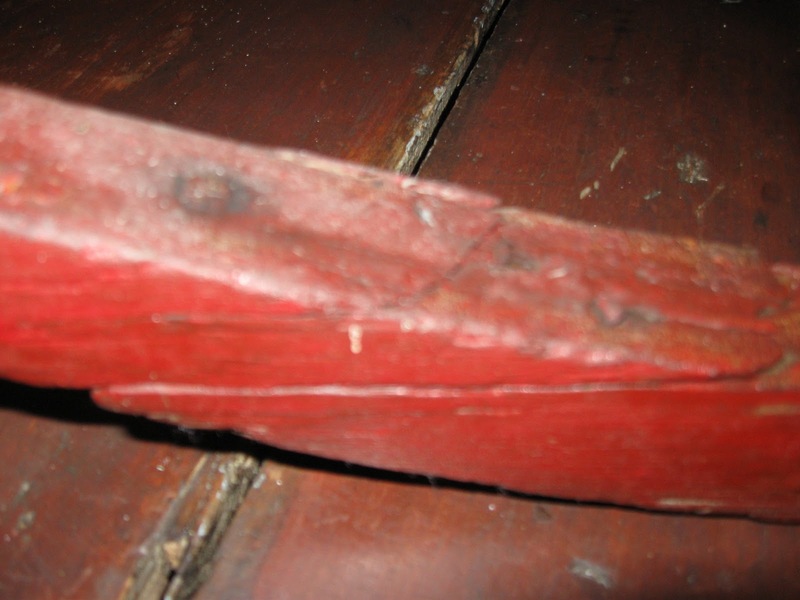 The previous owners had made a seat with cloth tape, probably because the original splint seat had worn through. Also, one of the rockers had broken at some point and had been repaired in excellent fashion. Apparently, through use, the little rocker had become shaky -- so someone corrected the wobbling chair by repairing it with tightly twisted wire. All these repairs gave the rocker many leases on its long life. So when I remember my childhood cradle during the holiday season, I now look at the little red chair and know that it represents family, love, caring and reuse -- my idea of what the holiday season should be about. 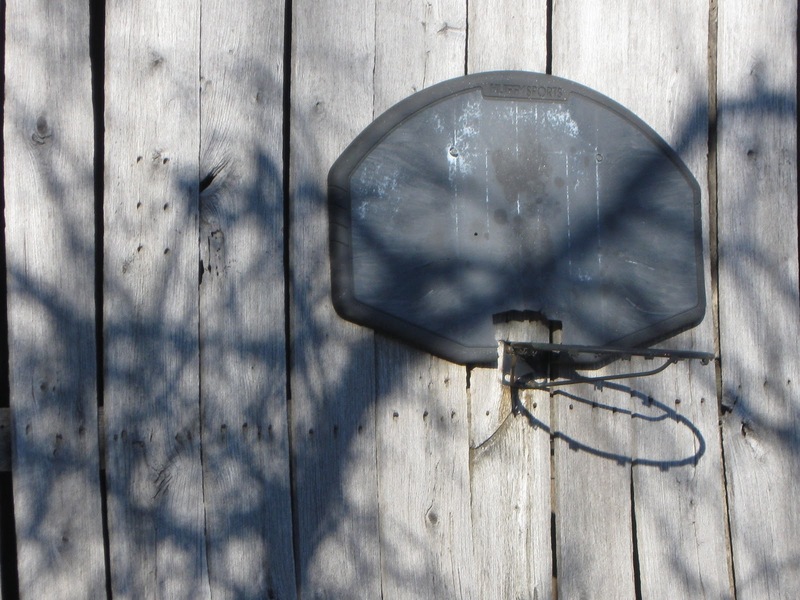 Attach a hoop to an old barn and gather your friends for a backcountry basketball game. City kids have nice urban cement courts but country kids use a barn to hang their hoop and the grass up against the barn for their court. In 1985, by coincidence, I learned about this elderly man that was an unknown folk artist. He was disabled and lived rather modestly in an old trailer in an urban setting. 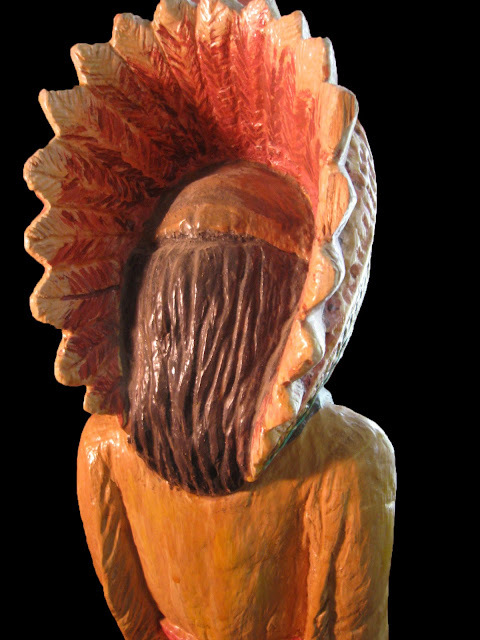 He worked in several mediums but his wood carvings were his favorite. 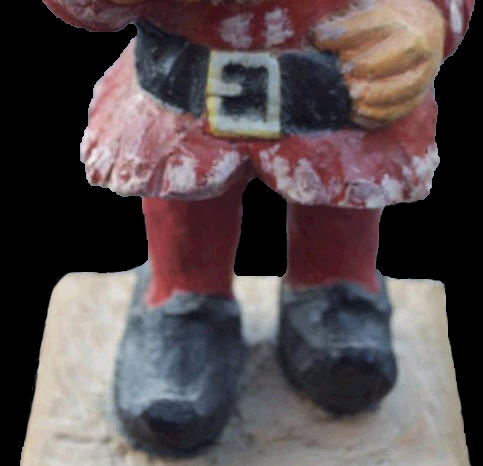 I was able to buy several carvings of women and men, painted and full bodied, about eight inches tall. Then he asked me if I would be interested in a tall Indian carving. 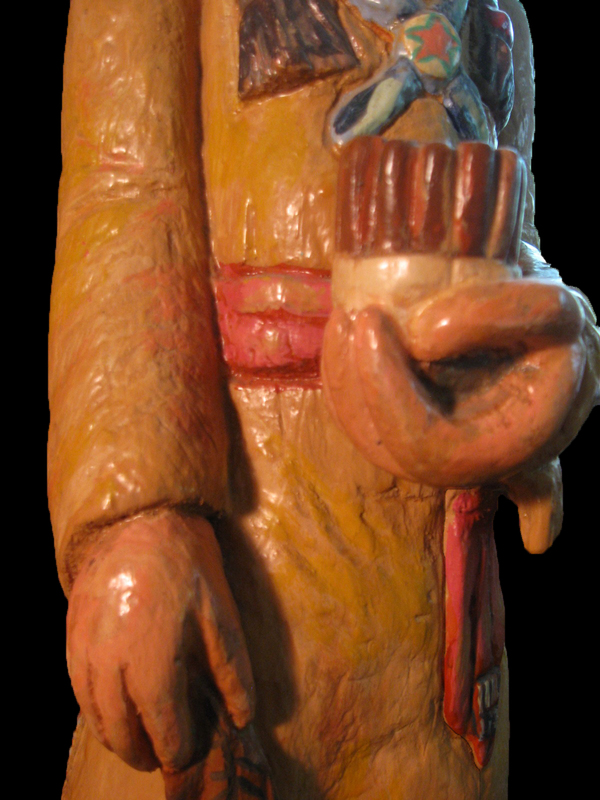 The Indian carving was a small replicate of a full-sized cigar store Indian that once could be found displayed outside of tobacco stores. The full-sized cigar store Indian was popular in the early to mid-twentieth century in the U. S. and perhaps before and also on the continent. The notion was that since tobacco was introduced by Native Americans an interpreted facsimile would be used in selling tobacco products. Therefore, the rather unlikely representation of an American Indian was born. Although we are aware that such figures as the cigar store Indian were carved with a "western eye" and therefore are not representative of true American Indian culture. 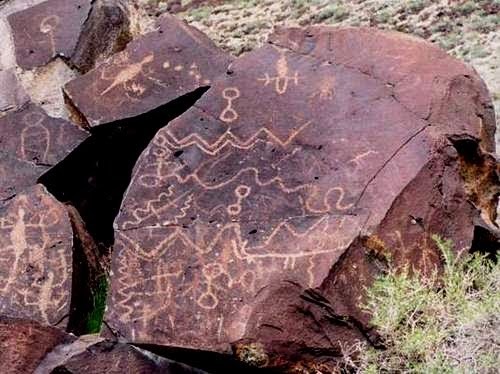 But these Indian carvings were part of the American culture of the time even with this misrepresentation of the native culture. 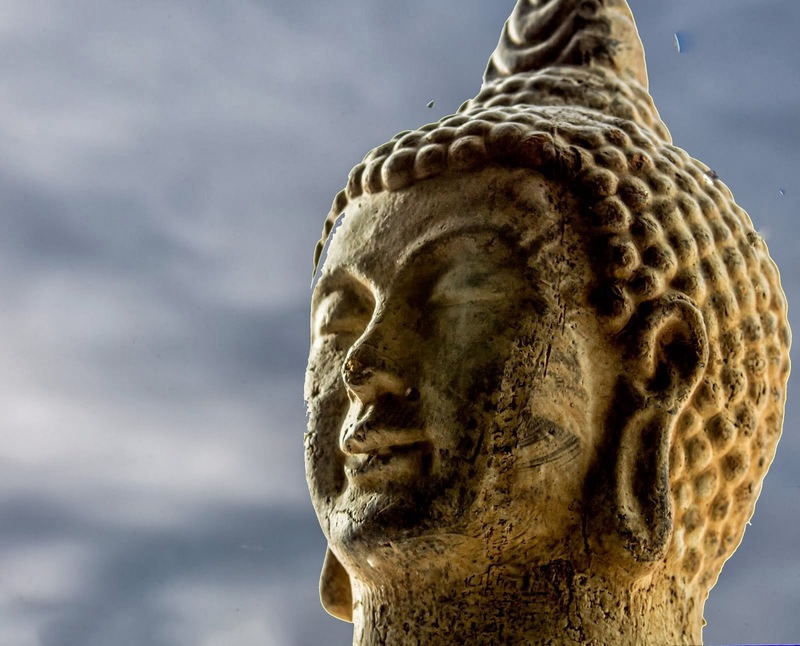 Such is culture -- you have a ying and yang relationship. I did buy the carving. This all happened 24 years ago. I was younger and not as fully into folk art as I am today. I eventually sold the small fugures for practically pennies and then gave the Indian to my son. 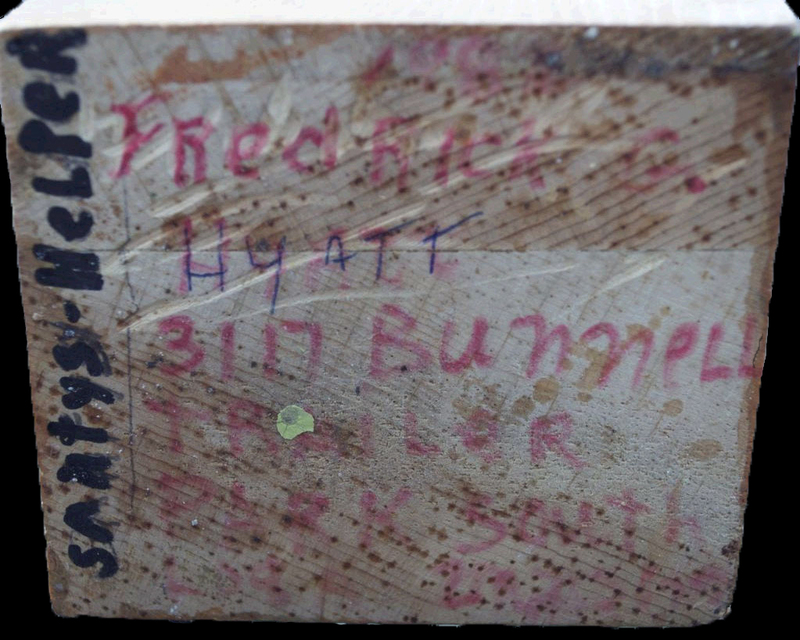 Today, I realize that I should have found out the history of this amiable folk carver named Fredrick Hyatt. So many questions I could have asked! Opportunity missed. A house in a very small town caught my eye as I was driving down its main street. I instantly knew I wanted to find out more about this place. I swung around and stopped in front of the house and noticed a sign attached to the garage. Sign said: NO TRESPASSING. Whoa, this stopped me dead in my tracks of going up to the door to introduce myself . I happened over to a nearby house and they told me the house was vacant -- and its owner was a lady in her eighties that was now living in a nursing home. With these few facts in hand I decided that I could take photos of the house from the street while searching for clues about the the owner. Initially, what attracted me to stop was the vernacular form of the house. But now I saw something else. -- it was the sitting porch standing as it probably stood when the elderly woman lived there. 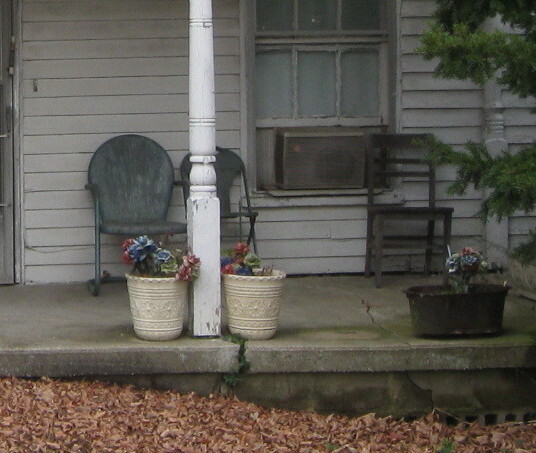 So, now I was looking at both the early architecture of the place and the front sitting porch. Based on the architecture, I put a date on the house as that of the early 1800s, It had not been restored, only preserved. It was an authentic example of a vernacular Federal/Greek Revival house. --How long had she lived in the house? 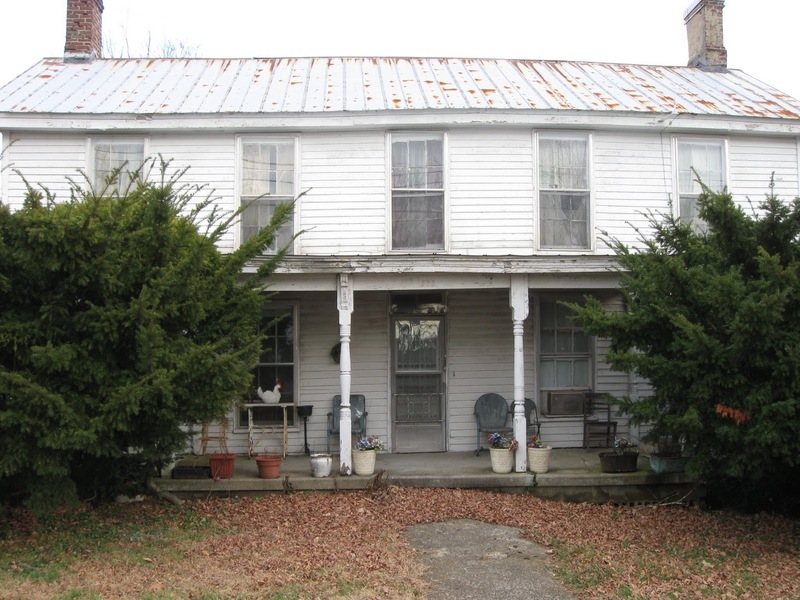 --Was this a family home that had passed through several generations? 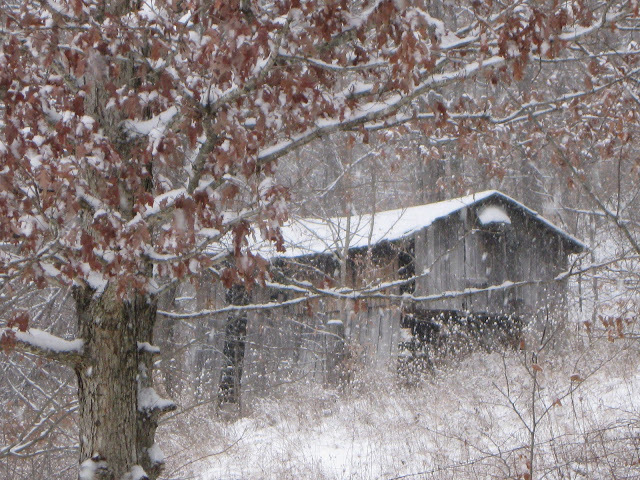 --Did she know who built the house or the garage or any of the outbuildings on the property?. --Was it a large house because large families had lived in it? Many other questions passed through my mind -- too many to write down here. Architecture aside, I turned to the sitting porch to seach for clues about the owner. It contained a little bit of interpretive material. The woman of eighty plus apparently liked plants as she had several planters sitting on the edge of the porch with remnants of former plants. She had some old metal chairs that appeared to be there for socializing. Some old vintage plant stands stood empty on part of the porch. 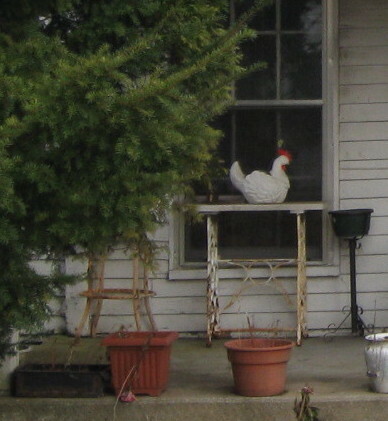 A chicken figure, that perhaps was a planter, sat on top of one of the stands. Together the architecture along with the materials on her porch seemed to tell me that over the years she made do with what she had. 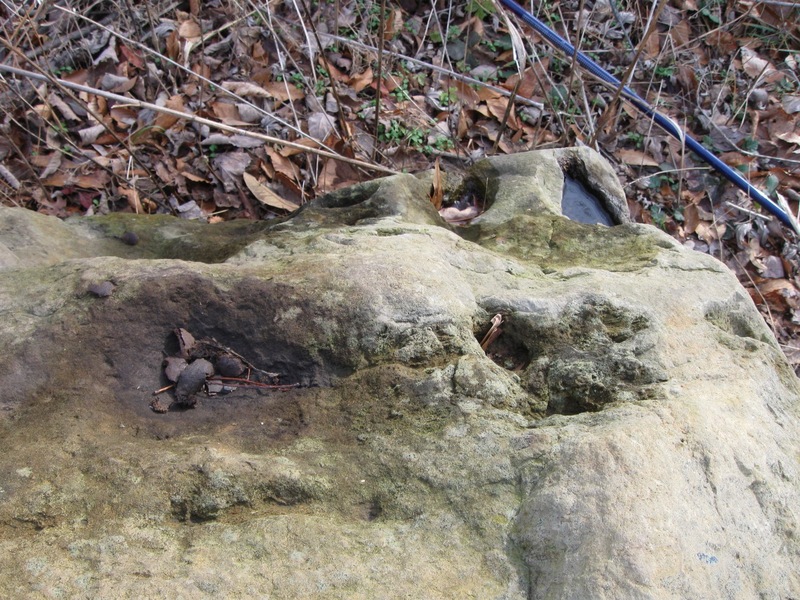 The house along with the porch artifacts remained "as is" over the years. "As is" meaning no changes. As an example of the remaining "as is" of the house architecture was the original weather-board siding, a few old outbuildings, old tin roof, original six over six window panes (also called lights), column pilasters on the porch, and a fan light over the front door. My conclusion about the elderly lady was that she liked to socialize, loved plants, and liked things to remain as they were. The over-all ambiance of the property gives one the ability to glance at a "real" historic setting -- not one that has been adulterated with the clean and sterile look of many museums. 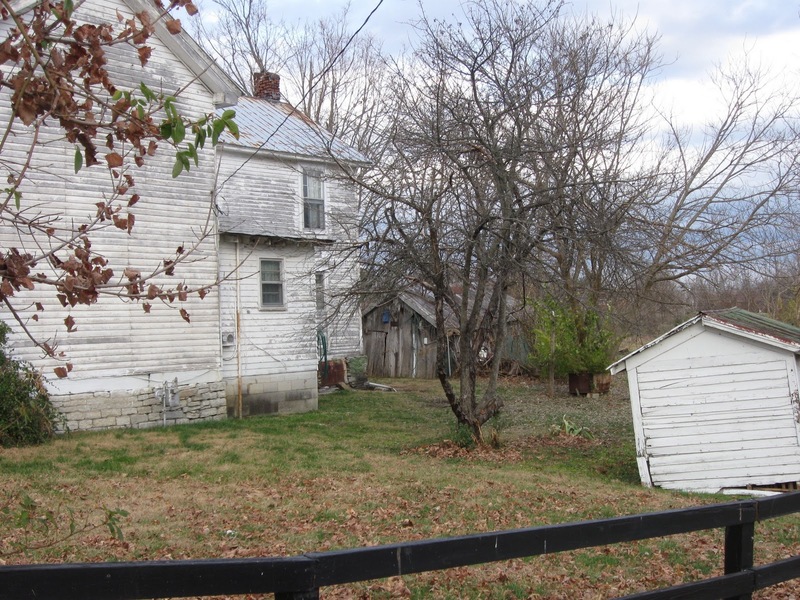 The overall place is in context to its landscape -- a small town in Kentucky. 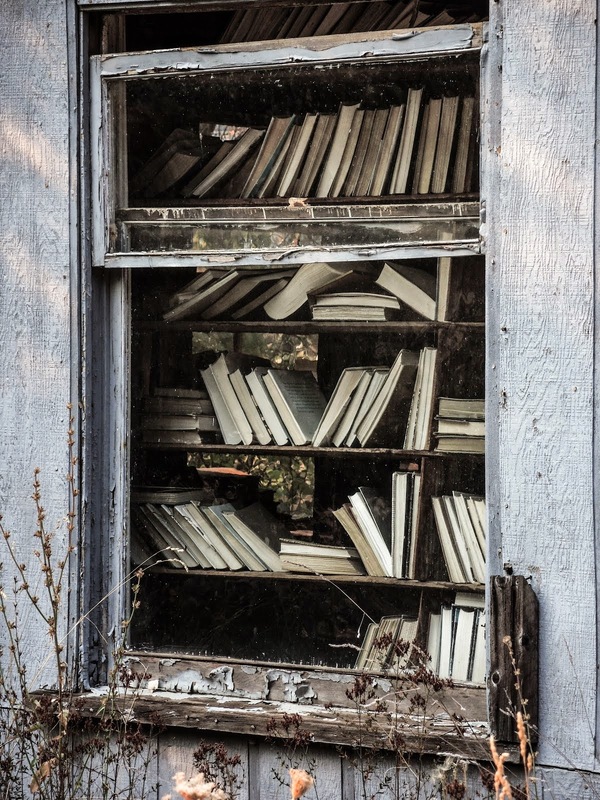 Its like an archaeological dig -- trying to interpret fragments into a viable story. Humans invariably leave debris when they have lived somewhere for any length of time. The interpretation may not be entirely accurate but is usually fairly close to reality. Congress comes back this week for the short lame-duck session. They failed to pass a oil spill bill before the election, and if they don’t do it during lame duck, it’s not likely to happen next year, or the year after, which would mean that they failed to address the biggest marine oil disaster in our history. Dwell on that. They will have done nothing to hold BP legally accountable for the environmental destruction they’ve wrought. Nothing for the ecosystems. Nothing for the threatened and endangered species. Nothing for those of us who care about them. 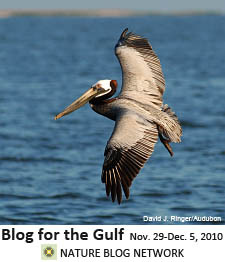 During the 2010 lame-duck congressional session, the U.S. Senate should pass legislation dedicating Deepwater Horizon disaster Clean Water Act (CWA) penalties to environmental restoration of the Gulf Coast. Without Senate action, billions of penalty dollars will likely disappear into the federal treasury and never reach the Gulf Coast. But clearly, this money should be used for environmental restoration in the region that was most directly affected by the oil disaster. The point of this whole post is therefore this: the squeaky wheel gets the grease. We need to make that wheel squeak like heck. We as bloggers have the ability to spread the word in a way that didn’t exist 21 years ago, when the Exxon Valdez ran aground. Don’t let the Gulf become another Valdez disaster – don’t let BP get away with it the way Exxon did. Contact your senator, your local papers, whomever else might make a difference. And spread the word: on your blog, on Facebook, on Twitter. The Nature Blog Network is leading a Blogging for the Gulf campaign to raise awareness and encourage action on the subject. 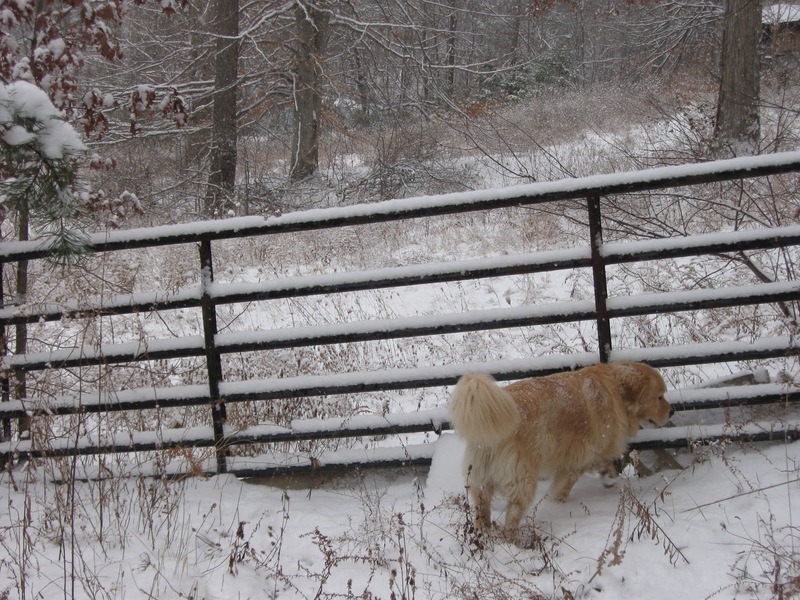 Nature always provides surprises to a walker along a trail. Recently, a few days after a rain, I moseyed down a trail close to my home and observed something I felt was a bit different. 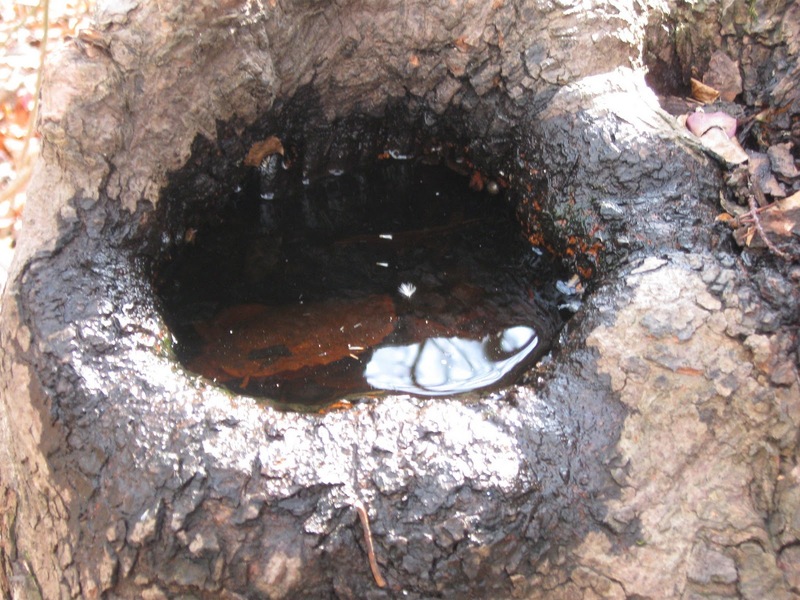 This was what could be considered miniature watering holes or as I call them -- nature's drinking cups. 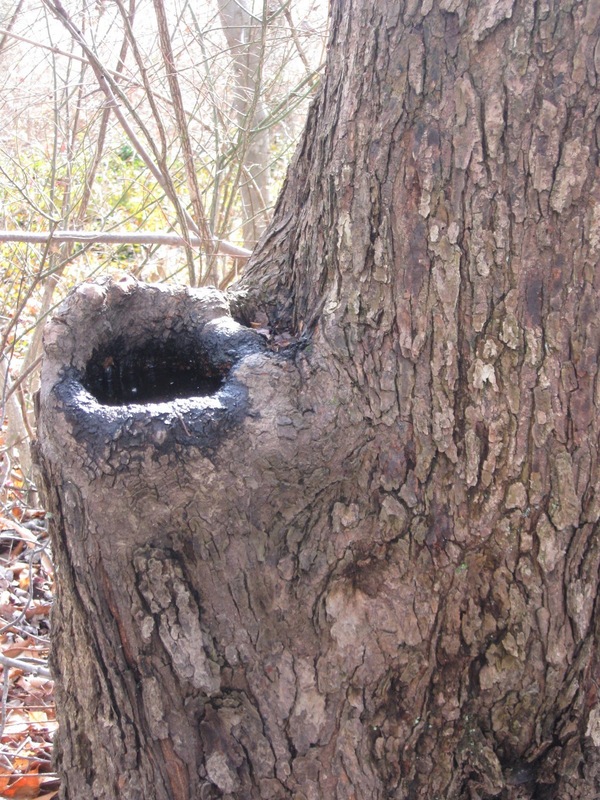 Above is a decayed limb that has a basin-like cavity at the top of its stub. When we have rain it fills and remains for several days. Here is a close up photo of the tree's drinking cup. As you can observe, clear fresh water is caught in the decayed basin. I imagine that birds and insects love these small places. Another basin like drinking cup. This one is in the hollow of a large boulder. I thought that the two examples of drinking cups displays the ingenious way that nature takes care of its little wild critters. 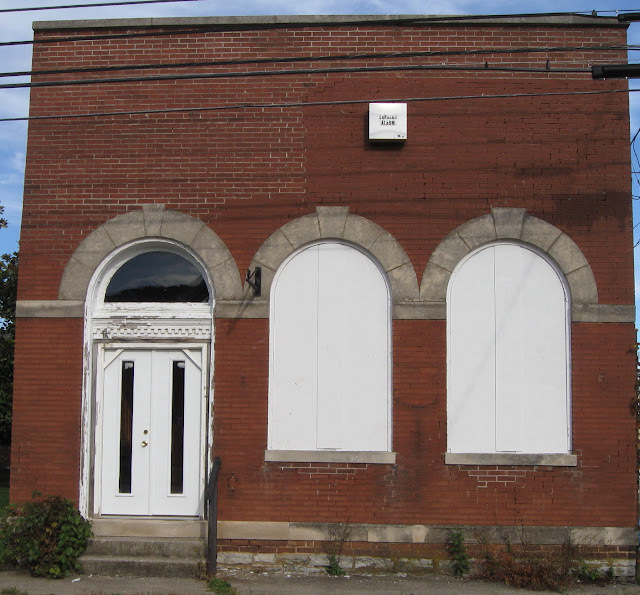 Unoccupied building with original exterior. "For, indeed, the greatest glory of a building is not in its stones, not in its gold. Its glory is in its Age, and in that deep sense of voicefulness, of stern watching, of mysterious sympathy, nay, even of approval or condemnation, which we feel in walls that have long been washed by the passing waves of humanity." The photo above is an example of Romanesque Revival (1870-1900) architecture only on a vernacular scale. Ruskin's influence helped popularize this style. 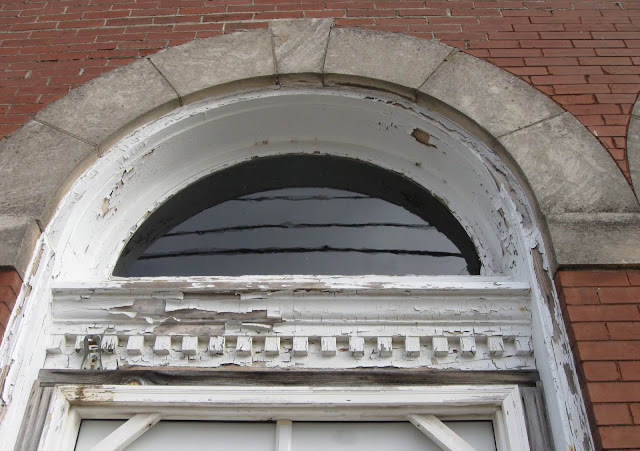 The above and below photos, of the old small Kirksville bank building, at one time served the locals but now stands empty. The building borrowed some Romanesque features to dress up a rather plain facade. It stands untouched by restoration. Restoration is insensitive renovation of historic buildings. Preservation seeks to conserve and protect them. To paraphrase Ruskin's words that advocates preservation, where one can feel . . . in the walls . . . the passing waves of humanity. Only when you preserve not restore will you have beauty in aging. Old Kirksville bank with some Romanesque windows and doors that reflect strength. 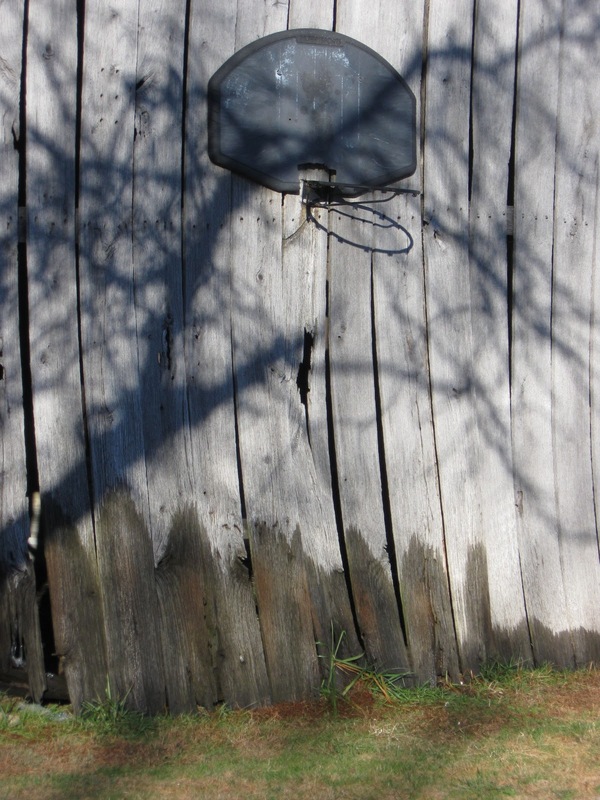 Boarded windows and a locked door reflect its emptiness..
Margaret's husband built the above concrete block root cellar in 1971 -- thirty-nine years ago when she was thirty-seven. 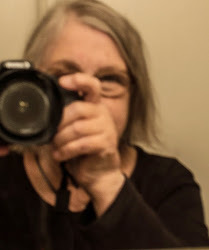 Today, Margaret is seventy six and no longer uses it. Our recent chat revealed that they once had a very large garden where they grew a wide variety of vegetables. She canned huge amounts of the harvest. One year she canned about 500 quarts of green beans. She gave lots of her vegetables away. Now she only grows a small patch of tomatoes as her husband helper passed a few years ago. 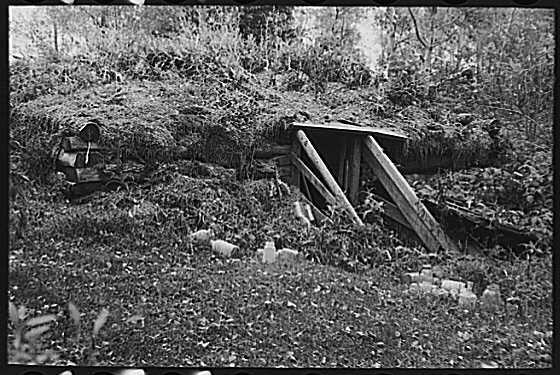 Some root cellars are inside houses, usually the basement. My mother had one in our basement that she called her fruit cellar. Maybe it is just a matter of semantics whether one calls the cellar -- fruit or root? 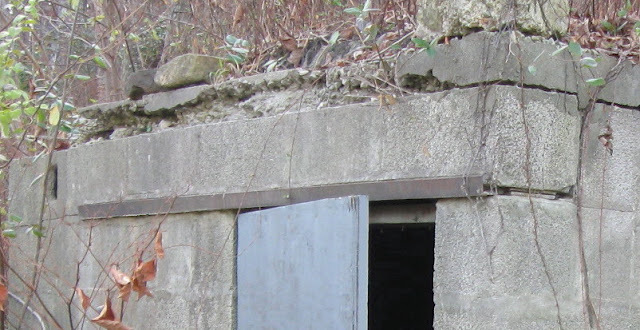 Most root cellars in the U.S. are built into sides of hills. The idea of root cellars was born in 17th century Europe and traveled to the U.S. They became a traditional part of rural living. They are not used in great abundance anymore but still can be found in some country areas. This particular cellar was built by Margaret's husband of cement block. He lined the walls with shelves to store the glass jars of canned goods. The floor space was saved to spread out potatoes. It was kept chock full. The cooling and insulating properties of the surrounding ground preserve the freshness of the fruit and vegetables. The temperature of these outside root cellars remain slightly above freezing during the winter which slows down spoilage. Produce stored in indoor cellars, usually the basement type, do not have the same storing qualities as the outdoor cellars. A wide variety of food could be stored in Margaret's cellar if she desired -- cured meats, milk, cheese, dried foods, canned food, fruit and vegetables. 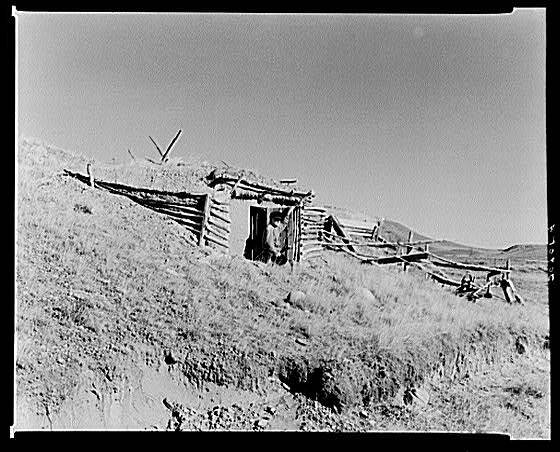 Here are a few Farm Security Administration photos of root cellars in the western part of the country. Photos were taken by the photographer Russell Lee who worked for the FSA during the depression years. 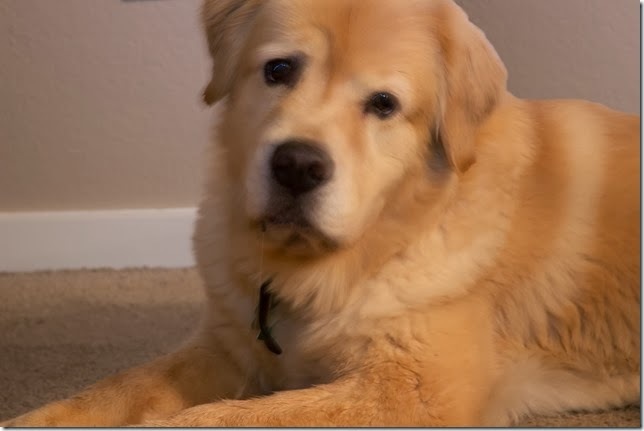 I have captioned my post's last three photos with information known about each one. 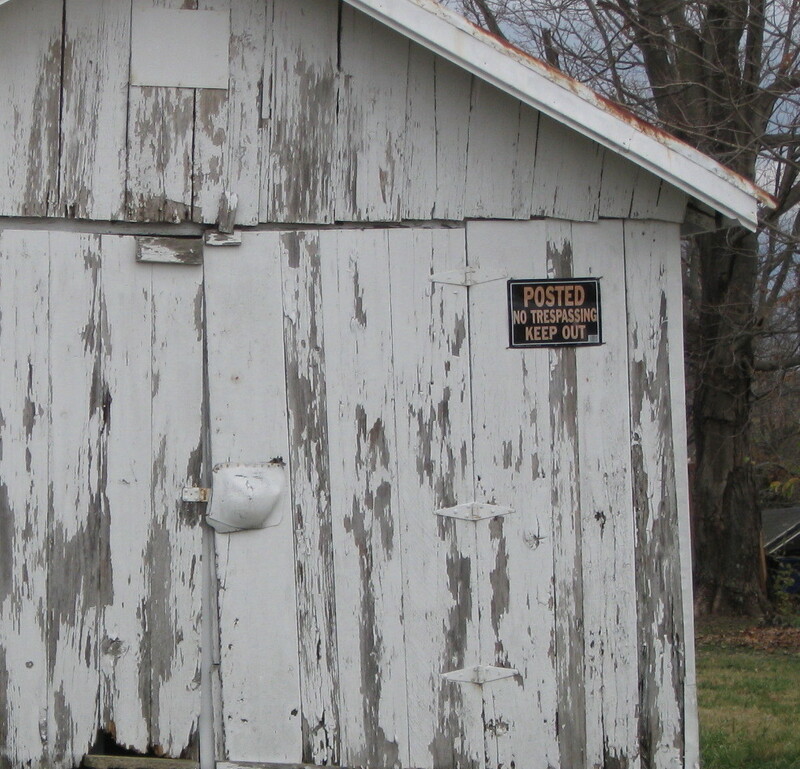 These pictures represent the "hey day," of root cellars. 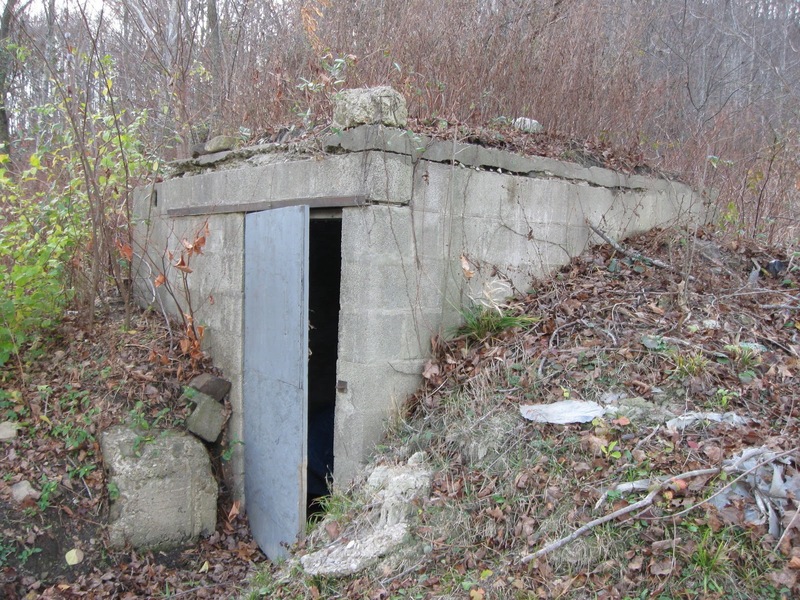 Root cellars appear to have had their peak periods during the 1800s through about 1950. Modern refrigeration put an end to the popularity of building such structures. That is except Margaret's husband who built his in 1971. 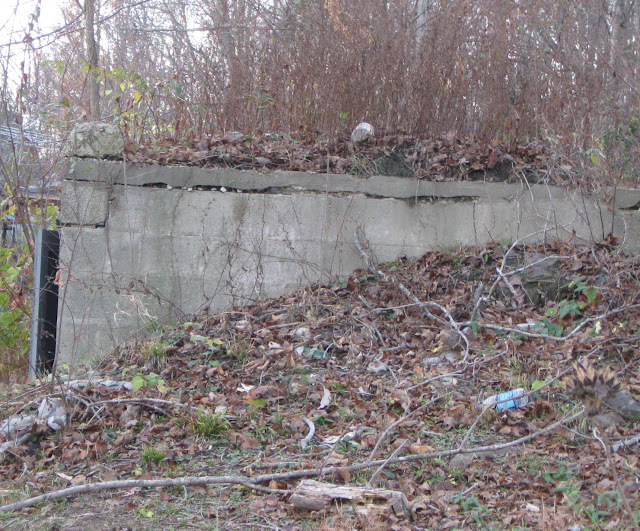 Recently, with the back to land movement, there has been renewed interest in root cellars. For a good discussion site on root cellars click here on nativestones.